Vermont is a state in the New England region of the northeastern United States. Vermont is the 6th smallest in area and the 2nd least populous of the 50 United States. It is the only New England state not bordering the Atlantic Ocean. Lake Champlain forms half of Vermonts western border, which it shares with the state of New York. The Green Mountains are within the state. Vermont is bordered by Massachusetts to the south, New Hampshire to the east across the Connecticut River, New York to the west, and the Canadian province of Quebec to the north. Originally inhabited by two major Native American tribes (the Algonquian-speaking Abenaki and the Iroquois), much of the territory that is now Vermont was claimed by France during its early colonial period. France ceded the territory to the Kingdom of Great Britain after being defeated in 1763 in the Seven Years War (in the United States, referred to as the French and Indian War). For many years, the nearby colonies, especially New Hampshire and New York, disputed control of the area (then called the New Hampshire Grants). Vermont is the leading producer of maple syrup in the United States. The state capital is Montpelier with a population of 7,855, making it the least populous state capital in the country. 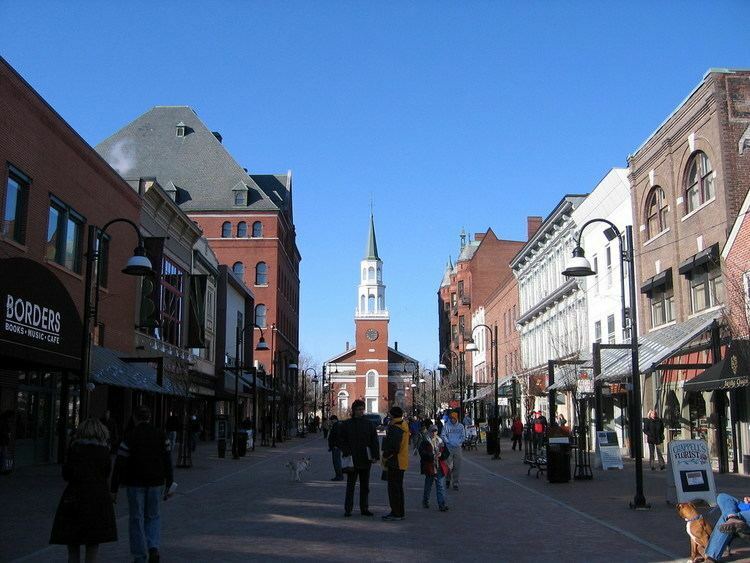 Vermonts most populous city is Burlington, with a 2013 population of 42,284, which makes it the least populous city in the United States to be the largest city within a state. Burlingtons metropolitan area has a population of 214,796. Vermont is one of the most racially homogeneous states; 94.3% of its population identified as white in 2010. Vermont is located in the New England region in the eastern United States and comprises 9,614 square miles (24,900 km 2), making it the 45th-largest state. It is the only state that does not have any buildings taller than 124 feet (38 m). Land comprises 9,250 square miles (24,000 km 2) and water comprises 365 square miles (950 km 2), making it the 43rd-largest in land area and the 47th in water area. In total area, it is larger than El Salvador and smaller than Haiti. The west bank of the Connecticut River marks the eastern (New Hampshire) border of the state (the river is part of New Hampshire). 41% of Vermonts land area is part of the Connecticut Rivers watershed. Lake Champlain, the major lake in Vermont, is the sixth-largest body of fresh water in the United States and separates Vermont from New York in the northwest portion of the state. From north to south, Vermont is 159 miles (256 km) long. Its greatest width, from east to west, is 89 miles (143 km) at the Canadian border; the narrowest width is 37 miles (60 km) at the Massachusetts line. The width averages 60.5 miles (97.4 km). The states geographic center is approximately three miles (5 km) east of Roxbury, in Washington County. There are fifteen US federal border crossings between Vermont and Canada. Several mountains have timberlines with delicate year-round alpine ecosystems, including Mount Mansfield, the highest mountain in the state; Killington Peak, the second-highest; Camels Hump, the states third-highest; and Mount Abraham, the fifth-highest peak. About 77% of the state is covered by forest; the rest is covered in meadow, uplands, lakes, ponds, and marshes. In 2007, Vermont was ranked by Forbes magazine as 32nd best among states in which to do business. It was 30th the previous year. In 2008, an economist said that the state had "a really stagnant economy, which is what we are forecasting for Vermont for the next 30 years." In May 2010, Vermonts 6.2 percent unemployment rate was the fourth lowest in the nation. This rate reflects the second sharpest decline among the 50 states since the prior May. The Brattleboro-based Vermont Theatre Company presents an annual summer Shakespeare festival. Brattleboro also hosts the summertime Strolling of the Heifers parade which celebrates Vermonts unique dairy culture. The annual Green Mountain Film Festival is held in Montpelier. Vermonts most recent best known musical talent was the group Phish, whose members met while attending school in Vermont and spent much of their early years playing at venues across the state. The rate of volunteerism in Vermont was eighth in the nation with 37% in 2007. The state stood first in New England. In 2011, Vermont residents were ranked as the healthiest in the country. Also in 2011, Vermont was ranked as the fourth most peaceful state in the United States. In 2011, Vermont residents were ranked as the sixth most fit/leanest in the country. Vermonters were the second most active citizens of state with 55.9% meeting the Centers for Disease Control and Preventions physical activity requirements. Vermont was ranked as the twelfth happiest state in the country.